This collection of fifty-two photographs from the early 1900s gives an insight into the lives local people led at that time in this scattering of Co. Armagh villages. 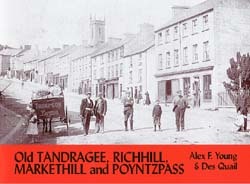 The book includes a history of these communities and the pictures feature scenes such as crowds gathering in Tandragee for a performance by Bosco's Circus, a steam-driven threshing machine at work in the fields near Tandragee, life on the canal at Poyntzpass, schooldays at Mullabrack Primary in Markethill, the mills at Glenanne and Laurelvale, and the long-gone general stores at Richhill and Clare. Also included are the railway stations at Tandragee and Markethill, a beautiful selection of views of Laurelvale, and possibly the only-known period photograph of Hamiltonsbawn.